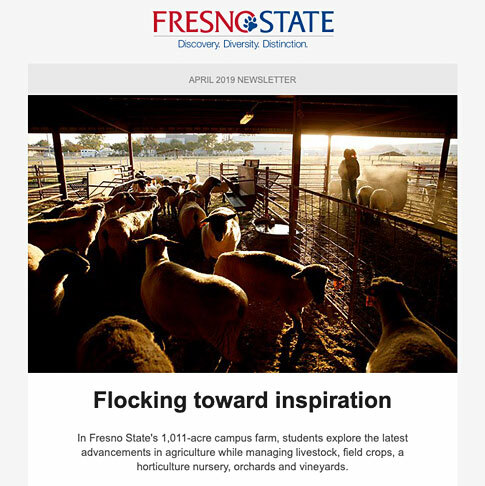 This monthly newsletter will show you how Fresno State and our community are stronger together and how together we can boldly make a difference in our region. We hope you’ll enjoy the many videos and fun features, check it every month for what’s new, and be inspired to come to campus! Missed a past edition? Check out the archives below for compelling stories about what’s happening at Fresno State. Want to know about all the fun and exciting things you can enjoy at Fresno State? Find out about concerts and events, community days, free services, big names coming to campus, and ways to stay involved. Just sign up for our community newsletter to be in the loop!